When we acquired the famous bronze buste of Charles Bedaux in 2004, from Mrs. Lucille Roberts, daughter of the late Mr. Charles English, President of the Chas. E. Bedaux Co. of Pacific States, Inc., she donated us the Addresses Book of her father, dated 1929. In this book are 132 companies specified, for which various Bedaux companies worked in 1929. When we met with Mr. George Ungar, 1998 in Toronto (George is the Canadian movie director who produced “The Champagne Safari”), he presented us with copies of a lot of interesting material he came across during his 16 years of research for the movie project. One particular interesting item was a publication titled “International Bedaux Company, Incorporated”, undated, bust me be approx. 1929. This publication gives addresses and short stories about all Bedaux companies in existence at that time. An other interesting item was a publication titled “International Bedaux Company, Incorporated”, undated, bust me be approx. 1929. This publication gives the names of all Bedaux People - from Chairman of the Board to Field Engineers - at that time. We are interested in a broad range of information, facts, stories and backgrounds. We invite you to help us with articles, photographs, links and suggestions. If you are interested we can send you more informatie about these subjects. Methods descriptions in various languages. Scientific publications in various languages about the Bedaux Method. "International Bedaux Company Incorporated", a publication listing all Bedaux companies and people as at approx. 1929. Addresses Book by Charles W. English, listing US and global Bedaux customers as at 1929. Vademecum for the Bedaux Engineer. International Bedaux 1950. Presented to Charles Emile Bedaux by Fern Bedaux. The Bronze bust of Charles E. Bedaux, presented to Charles W. English. The Bedaux Cine Kodak Measurement camera. 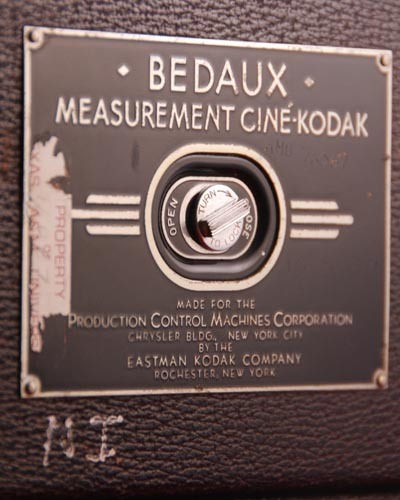 The Bedaux Cine Kodak Measurement projector. Bedaux Measurement Loop Winder, by Production Control Machines Corp. of N.Y.
Bedaux Measurement Number Plate, by Production Control Machines Corp. of N.Y.
Bedaux Slide Ruler, presented to Fern Bedaux by Jacques Saby.